I think next year we are going to do the foundation. OMG! I about died. 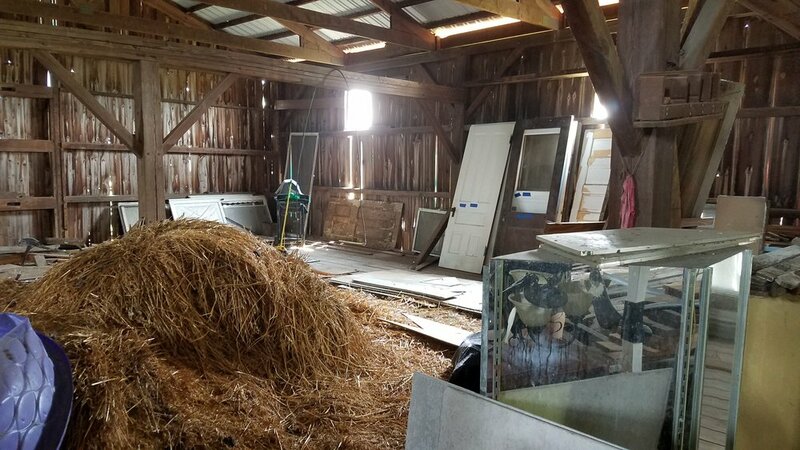 We had been upstairs in the barn earlier looking at the mess it had become. So of course after that statement I asked him to go downstairs and check it out. Well we did. Had to somewhat force him to, but not much. We got down there and I am not too happy at that moment. Not only had the bank wall foundation gotten worse. But the floral cooler was leaking. A lot. All over the barn floor. And the trusses. Yuck. Daylight and possible mold in our future. But I digress. Monday I started working on the upper level (main floor). I managed with my moms help to get about 6 wheel barrows full of burn out of the barn. As well as some large things that were burn. I also got to go through my door collection. I figured I would have too many. But I actually need a few more!